Student demonstrations against a proposed increase in tuition fees have grown into the most potent protest movement in North America of the day. Like Occupy, the ‘Red Square’ movement demands less emphasis on neoliberal values. And like the Arab Spring, young protesters in the streets want to bring the government to its knees. Night has fallen in Montreal, and that means time for a new battle ritual. 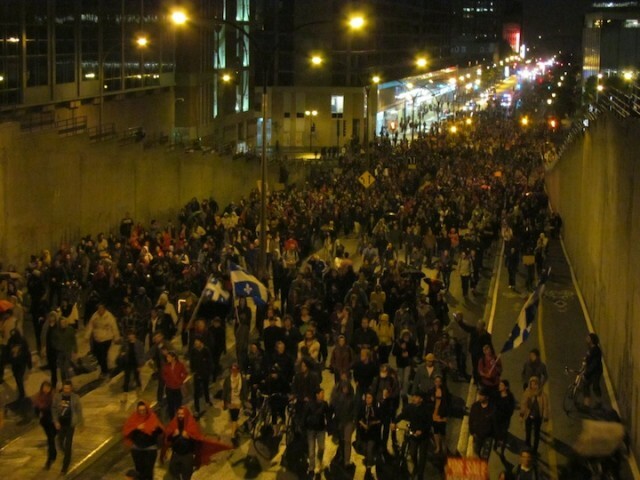 Thousands of young people have gathered in Place Émilie-Gamelin for a daily evening march through the streets of the French-speaking metropolis. Most demonstrators have pinned a small red square to their clothes. They chant “À nous la rue!” – the street is ours! Without obvious leadership and flanked by police officers in cars, on motorcycles and bicycles, the sea of youth winds an uncharted route through the city, its progress traced live on Twitter. Like protests under the ‘Occupy’ banner, slogans are chanted against capitalism, but also against the Liberal provincial government of Quebec. Helicopters are hovering overhead. “Shame on you,” a woman yells to the protesters from a balcony. The large-scale demonstration is part of a growing student rebellion that has dominated Quebec for three months – and that has grown into a powerful protest movement, the largest in North America at this time. What began as a regional conflict over tuition fees has in recent weeks escalated to deep, and sometimes violent, unrest over neoliberal cuts in social spending in the name of fiscal discipline and the right to demonstrate against them. Demonstrators during an evening march in Montreal. Supporters of the movement of the Red Square – a symbol for the fight against poverty – take inspiration from the Arab Spring. Like in Cairo, demonstrators in Montreal are aiming to bring the government to its knees from the streets. They are supported by the sovereigntist opposition in the province, and by leftist personalities like author Margaret Atwood and filmmaker Michael Moore. The popular Montreal rock group Arcade Fire boosted the movement this weekend by wearing red squares during a performance on the American TV show Saturday Night Live. Since February, Demers has been taking part in the action that launched the Red Square movement: a large-scale boycott of classes by students in Quebec, in protest against a plan by the provincial government to lift a long-standing freeze in tuition fees. The government wants to raise the contribution of students to their own studies by 75 per cent over seven years, from almost $2,200 to $3,800 per year. The measure, which comes down to an annual increase in tuition fees of about $250, is intended to better finance universities and colleges and to combat the budget deficit. Although Quebec has the lowest tuition fees in North America, student groups are adamantly opposed to the plan. Education should be free, they argue. They don’t compare Quebec with other parts of Canada or the United States, but with Europe, where affordable access to higher education is seen as a fundamental right for everyone. About 155,000 students of a total of 475,000 take part in the boycott, which they call a strike. The action marked its 100th day yesterday with a giant manifestation of more than 100,000 demonstrators in the streets of Montreal. The academic semester at participating institutions has been suspended. 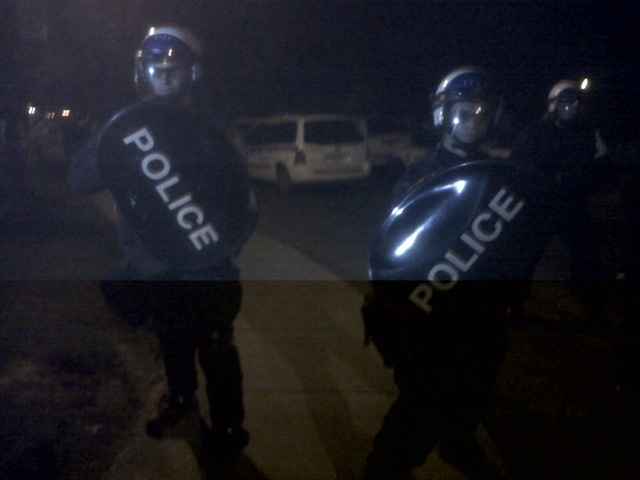 Police block a street during an evening protest march by students in Montreal. In recent weeks, demonstrations have led to riots and vandalism. Students have blocked bridges and highways, shut down Montreal’s metro system with smoke bombs, and the evening demonstrations have often produced clashes with police and dozens of arrests. Earlier this month, angry students blockaded colleges and stormed a university to prevent others who wanted to attend their lectures from doing so – even though a court ordered that those students should have access to their classes. Last week, the government of Premier Jean Charest responded to the unrest by introducing an emergency law to restrict the demonstrations. Under this law, ‘Loi 78’, protest marches are banned if the route is not provided to police in advance. The same goes for demonstrations within 50 meters of an educational institution. The severe measure, while supported by sections of the population who are tired of the unrest, has caused a wave of outrage among students and other citizens, as well as newspapers and civil rights organizations that have strongly denounced it. Instead of ending the protests, the step has led to larger manifestations, now also in defense of the right of free assembly. The rule to provide routes to police is ignored. Indeed, the law has enabled the Red Square movement to take on the aura of a liberation movement against a repressive regime. In a pun on the Canadian symbol of the maple, the movement is described by some as printemps érable, which sounds like the French term for the Arab Spring, printemps arabe. 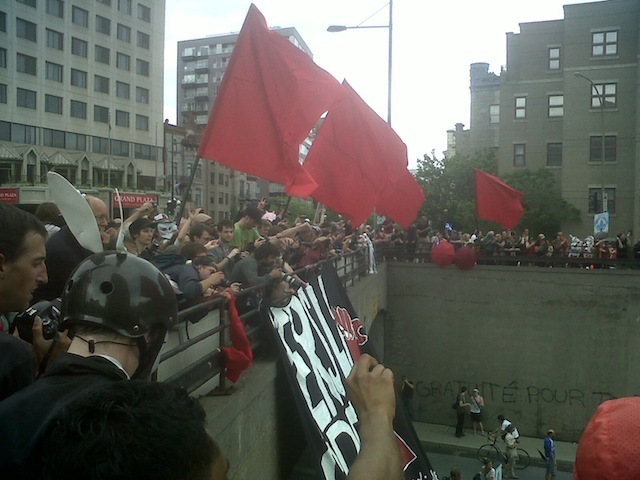 Protesters with red square flags during a student demonstration in Montreal. 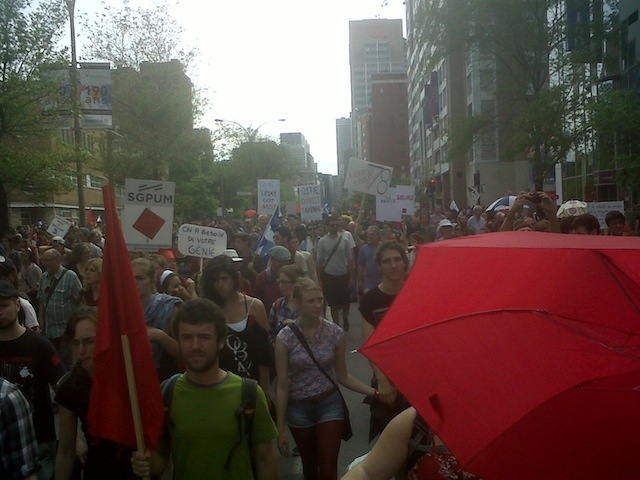 Protest march by students in Montreal during the day.